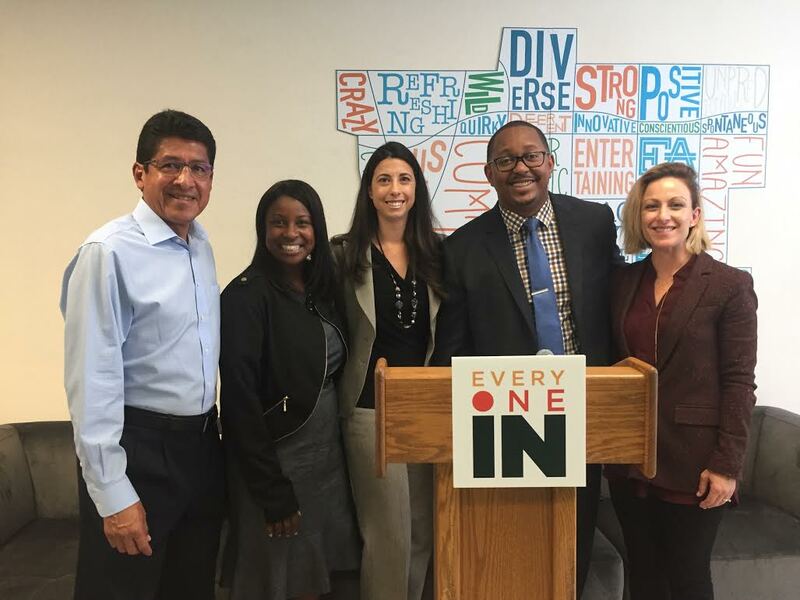 Long Beach Vice Mayor Richardson Launches “Everyone In” Initiative, Addressing Economic Inclusion | Propel L.A.
Pictured above: Economic Development Commission Chair Randal Hernandez, LA LISC Executive Director Tunua Thrash-Ntuk, Councilwoman Stacy Mungo, Vice Mayor Rex Richardson, and Long Beach Community Foundation President and CEO Marcelle Epley. Photo by Stephanie Rivera. November 4, 2017. Written by Stephanie Rivera, Long Beach Post. In the spring of 2017, the Long Beach City Council adopted the Blueprint for Economic Development, a guide meant to prioritize the creation of businesses, well-paying jobs and economic inclusion for all Long Beach residents for the next ten years. At this Tuesday’s city council meeting, Vice Mayor Rex Richardson plans to set in motion one of the plan’s focus areas when he introduces a package of proposals to his peers addressing economic inclusion. 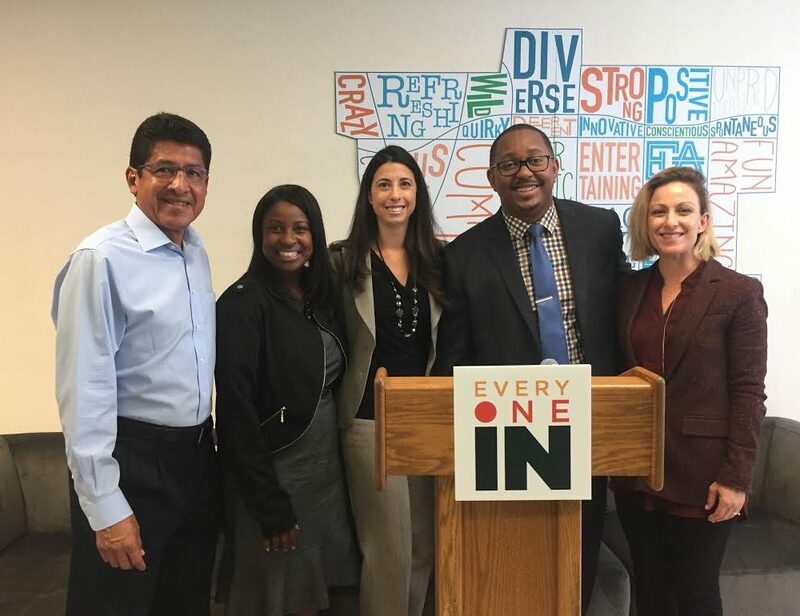 Richardson revealed those plans Wednesday afternoon at the Uptown Business Improvement District Office filled with over a dozen community stakeholders in North Long Beach when he officially launched the “Everyone In” Economic Inclusion Initiative. Propped up on stands to the left of Richardson were boards displaying statistics of Long Beach he highlighted, including that five times as many Latinos and Native Americans live in high poverty neighborhoods compared to Whites, and that twice as many Black and Latino female adults are working full-time and still living below 150 percent of the poverty level than other adult females. And that homeownership among Black and Latinos is half as many as White households and fewer than 15 percent of Asian and Black residents have access to the right resources they need to start up a business or own a business. Richardson, who last year spearheaded the creation of an Office of Equity, introduced the first series of proposals meant to help close those gaps, each of which include the backing of other council members. One proposal includes providing access to free checking and savings accounts and conducting financial literacy education to all youth participants in Long Beach workforce development programs. Another request is to have the city manager work with the Office of Equity to conduct an economic equity study on the city in partnership with a philanthropic or educational partner. Read the full article in Long Beach Post.